This is a conversation on the Internet of Things I recorded with my colleague Chris Moore as part of his podcasted lecture series on cyberculture. As interviews go this is quite organic, without a set script of questions and answers, hence the rambling style and side-stories. Among others, I discuss: the Amazon Echo [Alexa], enchanted objects, Mark Weiser and ubiquitous computing, smart clothes, surveillance, AI, technology-induced shifts in perception, speculative futurism, and paradigm shifts. This is an extended chapter abstract I wrote for an edited collection titled Atmospheres of Scale and Wonder: Creative Practice and Material Ecologies in the Anthropocene, due by the end of this year. I am first laying the groundwork in actor network theory, then developing the concept of hierophany borrowed from Eliade, and finally [where the fun begins], discussing the Amazon Echo, the icon of the Black Madonna of Częstochowa, and the asteroid 2010 TK7 residing in Earth Lagrangian point 4. An object from the internet of things, a holy icon, and an asteroid. To my best knowledge none of these objects have been discussed in this way before, either individually or together, and I am very excited to write this chapter. What if we imagined atmosphere as a framing device for stabilizing material settings and sensibilities? What you call a fetishized idol, is in my atmosphere a holy icon. What your atmosphere sees as an untapped oil field, I see as the land where my ancestral spirits freely roam. Your timber resource is someone else’s sacred forest. This grotesque, and tragic, misalignment of agencies is born out of an erasure, a silencing, which then proceeds to repeat this act of forced purification across all possible atmospheres. This chapter unfolds within the conceptual space defined by this erasure of humility towards the material world. Mirroring its objects of discussion, the chapter is constructed as a hybrid. First, it is grounded in three fundamental concepts from actor network theory known as the irreduction, relationality, and resistance-relation axioms. They construct an atmosphere where things respectively: can never be completely translated and therefore substituted by a stand-in; don’t need human speakers to act in their stead, but settings in which their speech can be recognized; resist relations while also being available for them. When combined, these axioms allow humans to develop a sensibility for the resistant availability of objects. Here, objects speak incessantly, relentlessly if allowed to, if their past is flaunted rather than concealed. Building on that frame, the chapter adopts, with modifications, the notion of a hierophany, as developed by Mircea Eliade, as a conceptual frame for encountering the resistant availability of material artefacts. In its original meaning a hierophany stands for the material manifestation of a wholly other, sacred, order of being. Hierophanies are discontinuities, self-enclosed spheres of meaning. Arguably though, hierophanies emerging from the appearance of a sacred order in an otherwise profane material setting can be viewed as stabilizing techniques. They stabilise an atmospheric time, where for example sacred time is cyclical, while profane time is linear; and they stabilise an atmospheric space, where sacred space is imbued with presence by ritual and a plenist sensibility, while profane space is Euclidean, oriented around Cartesian coordinates and purified from sacred ritual. Finally, building on these arguments, the chapter explores the variations of intensity of encounters with hierophanic presences at three scales, anchored by three objects. Three objects, three scales, three intensities of encounter. The first encounter is with the Amazon Echo, a mundane technical object gendered by its makers as Alexa. An artefact of the internet of things, Alexa is a speaker for a transcendental plane of big data and artificial intelligence algorithms, and therefore her knowledge and skills are ever expanding. The second encounter is with the icon of the Black Madonna of Częstochowa in Poland, a holy relic and a religious object. The icon is a speaker for a transcendental plane of a whole different order than Alexa, but crucially, I argue the difference to be not ontological but that of hierophanic intensities. The third encounter is with TK7, an asteroid resident in Earth Lagrangian Point 4, and discovered only in 2010. TK7 speaks for a transcendental plane of a wholly non-human order, because it is quite literally not of this world. All three objects have resistant availability at various intensities, all three have a hierophanic pull on their surroundings, also at various intensities. Alexa listens, and relentlessly answers with a lag less than 1 second. The Black Madonna icon listens, and may answer to the prayers of pilgrims. TK7 is literally not of this world, a migratory alien object residing, for now, as a stable neighbor of ours. As I posted earlier, I am participating in a panel on data natures at the International Symposium on Electronic Art [ISEA] in Hong Kong. My paper is titled Object Hierophanies and the Mode of Anticipation, and discusses the transition of bid data-driven IoT objects such as the Amazon Echo to a mode of operation where they appear as a hierophany – after Mircea Eliade – of a higher modality of being, and render the loci in which they exist into a mode of anticipation. I start with a brief section on the logistics of the IoT, focusing on the fact that it involves physical objects monitoring their immediate environments through a variety of sensors, transmitting the acquired data to remote networks, and initiating actions based on embedded algorithms and feedback loops. The context data produced in the process is by definition transmitted to and indexed in a remote database, from the perspective of which the contextual data is the object. The Amazon Echo continuously listens to all sounds in its surroundings, and reacts to the wake word Alexa. It interacts with its interlocutors through a female sounding interface called the Alexa Voice Service [AVS], which Amazon made available to third-party hardware makers. What is more, the core algorithms of AVS, known as the Alexa Skills Kit [ASK] are opened to developers too, making it easy for anyone to teach Alexa a new ‘skill’. The key dynamic in my talk is the fact that human and non-human agencies, translated by the Amazon Echo as data, are transported to the transcendental realm of the Amazon Web Services [AWS] where it is modulated, stored for future reference, and returned as an answering Echo. In effect, the nature of an IoT enabled object appears as the receptacle of an exterior force that differentiates it from its milieu and gives it meaning and value in unpredictable ways. Objects such as the Echo acquire their value, and in so doing become real for their interlocutors, only insofar as they participate in one way or another in remote data realities transcending the locale of the object. Insofar as the data gleaned by such devices has predictive potential when viewed in aggregate, the enactment of this potential in a local setting is always already a singular act of manifestation of a transcendental data nature with an overriding level of agency. In his work on non-modern notions of sacred space philosopher of religion Mircea Eliade conceptualized this act of manifestation of another modality of being into a local setting as a hierophany. Hierophanies are not continuous, but wholly singular acts of presence by a different modality. By manifesting that modality, which Eliade termed as the sacred, an object becomes the receptacle for a transcendental presence, yet simultaneously continues to remain inextricably entangled in its surrounding milieu. I argue that there is a strange similarity between non-modern imaginaries of hierophany as a gateway to the sacred, and IoT enabled objects transducing loci into liminal and opaque data taxonomies looping back as a black-boxed echo. The Echo, through the voice of Alexa, is in effect the hierophanic articulator of a wholly non-human modality of being. Recently, Sally Applin and Michael Fischer have argued that when aggregated within a particular material setting sociable objects form what is in effect an anticipatory materiality acting as a host to human interlocutors. The material setting becomes anticipatory because of the implied sociability of its component objects, allowing them to not only exchange data about their human interlocutor, but also draw on remote data resources, and then actuate based on the parameters of that aggregate social memory. In effect, humans and non-humans alike are rendered within a flat ontology of anticipation, waiting for the Echo. 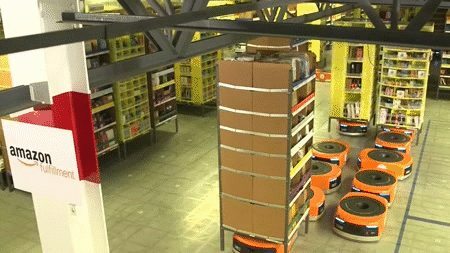 Amazon’s warehouse robots in a machinic routine. I can watch this all day. With the iPad openly poised to attack the Kindle in the e-books business, the clash is not only between two major players, but between two astonishingly diverse philosophies. Apple is all about total control, Amazon is all about the long tail. More than that, Apple is all about inserting itself in and enlarging the margin between its customers and their desires – with the omnipresent ‘i’ in front of your pod, pad, computer, mouse, earphones, keyboard, screen, operating system, etc. You shall desire only the iThing. The paradigm for Apple is the top-down guru-led religious cult. Amazon on the other hand is about extending the channel of distribution as far as the customer’s most insignificant desires – they have built that into their core company DNA. You read as a kid a long-forgotten pirate book by Sabatini and suddenly feel the urge to re-read it? Yes, it’s out of print, but not only are we going sell you that book, we can offer you these 5 other books which people like you recently bought. The paradigm here is the Damascus souk. You want a jade necklace? I don’t have them but my cousin’s brother in law knows someone who has, and I will sell it to you for a discount, together with this rose-wood box (you need to keep them somewhere). So, back to the iPad and Kindle, a recent article in the New Yorker by Ken Auletta describes nicely the situation the publishing business will have to face in the near future. E-books are the future – judging by the massive sales Amazon is doing through the Kindle – but are publishers part of this future? Apple wants to lock in customers and publishers into the cult – no doubt practicing iReading. Publishers would still get their cut, which sure beats not getting anything. Amazon wants to eliminate the publishers altogether and deal directly with authors and readers. One obvious result will be that the barrier to author publishing will fall drastically.